Oxford is popular as movie locations and TV film sites and many visitors come to Oxford especially to see where their favourite television series or movies were filmed. TV series such as Inspector Morse and Midsommer Murders have strong connections with Oxford, and the number of visitors to Oxford increased substantially since the release of the Harry Potter movies. Harry Potter Oxford Locations: Harry Potter Oxford scenes were shot at Christ Church College (the staircase to the hall), the Bodleian Library (Hogwarts Infirmary and dance practice room) and New College cloisters (featured in Harry Potter and the Goblet of Fire) and also Radcliffe Square. 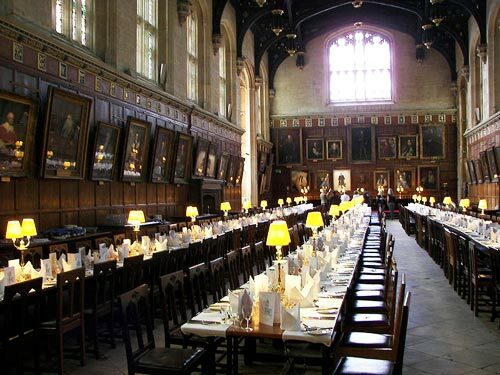 The Great Tudor Hall at Christ Church inspired Hogwarts Hall. The Pitt Rivers Museum is said to have inspired Diagon Alley. Harry Potter fans can potter in the footsteps of Harry with one of the Harry Potter Oxford tours run by the Tourist Office. Inspector Morse and Lewis Film Sites: Still hugely popular with audiences all over the world, Colin Dexter’s TV series of Inspector Morse was filmed extensively on location in Oxford city. Inspector Morse Guided Walking Tours visit many of the city centre locations featured in the various series, from popular pubs to Exeter College, where Morse suffered his fatal heart attack. The Lewis series, starring Kevin Whately, keep images of Oxford on our television screens. Fans of Inspector Morse can buy a number of books pinpointing exact Oxford film sites from the Oxford Tourist Information Centre. The Golden Compass: Starring Nicole Kidman, Golden Compass features scenes shot in or around Exeter College, Christ Church, the Radcliffe Camera and the Clarendon Building. Based on His Dark Materials by Oxford novelist Philip Pullman, the movie highlights many Oxford locations. XMen4: Shot in Catte Street and around the Sheldonian. Alice in Wonderland: None of Tim Burton’s film of ‘Alice’ was shot in Oxford; however, the two ‘Alice’ books were based on real characters and locations in Oxford. The Oxford Tourist Information Centre runs ‘Alice’ tours as part of their Themed walking tours. The Oxford Murders (2008): Based on the novel by Guillermo Martinez the Oxford Murders stars John Hurt as an Oxford University academic who delves into the investigation of a series of murders linked – Da Vinci Code-style – by mathematical symbols. There are of course many more movies that were filmed in Oxford and those interested in film-themed Oxford tours should check with the Tourist Office in Broad Street. Search for Oxford hotels, read hotel reviews and book your Oxford hotel HERE. See more Oxford photos at Travelsignposts Oxford photo gallery HERE.